Monitor all connections to the Internet. Is there a better alternative to AbruStop Privacy Protection? Is AbruStop Privacy Protection really the best app in Security category? Will AbruStop Privacy Protection work good on macOS 10.13.4? 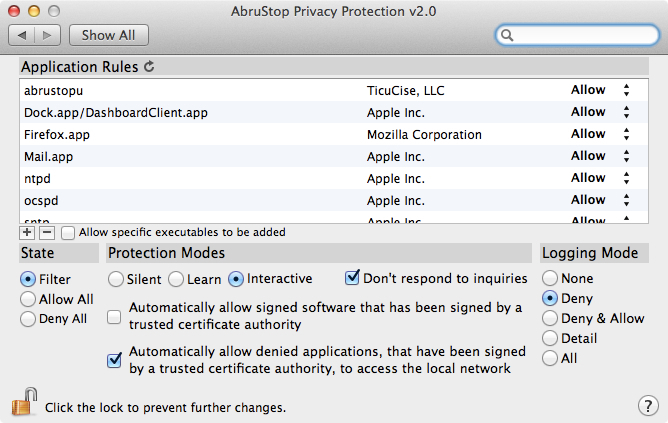 AbruStop Privacy Protection is an OS X application firewall that protects the customer's private data by preventing known and unknown software from secretly establishing a connection to the internet. AbruStop has the following features: code signature validation, multi-protocol support, real-time configuration, connection intervention, unobtrusive operation, connection unity, stealth mode, essential service option, network suspension, always on, resource-friendly, network-address aware. Visit http://www.ticucise.com/abrustop for more information. AbruStop Privacy Protection needs a rating. Be the first to rate this app and get the discussion started!